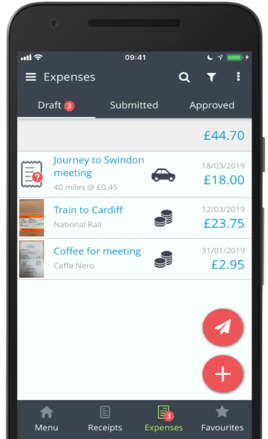 Submit your expenses on the mobile app to send them for Approval. 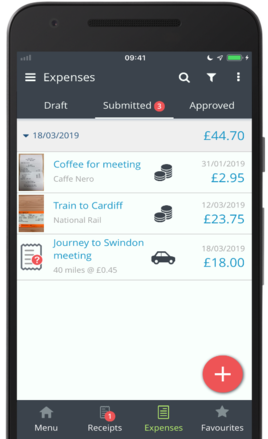 Any created Draft expenses will be stored in the Draft section, any expenses Awaiting Approval can be found in the Submitted section and Approved expenses will be stored in the Approved section. To access your expenses area, tap the Expenses icon. By default you will be taken to your Draft expenses section. 2. Use the Search and Filter options to help you find the Draft expenses you wish to Submit. Apply a Filter to help you locate the expenses: Tap the Filter icon and select a filter option. 3. Tap the Paper Airplane and the Draft expenses will be selected. If you wish to deselect an expense which has been highlight please tap the expense to unselect. 4. Tap the Submit button once ready. If any policy issues have been detected with your expenses a Policy warning will appear. This warning will state what policy an expense is in breach of. Providing your policy is "warn only" you can still submit your expenses by clicking Yes to continue. If you have any blocks enabled on your company policy, the system will block you from submitting these expenses. 5. Your submitted expenses will now reside in the Submitted area. 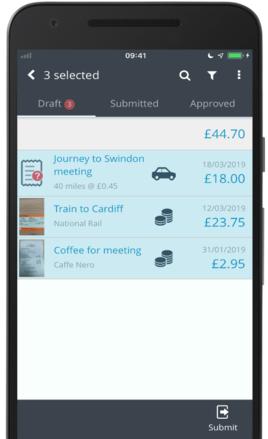 You can move between Draft, Submitted and Approved expenses by tapping the different areas on your screen. The Search and Filter options are available to you for use in all section of Expenses. If you need to recall an expense that is awaiting approval, you can recall that expense back to your Draft area.